Over the weekend my husband and I decided to go out for dinner to Officine Brera on 6th street which is one of our favorite restaurants in the downtown Los Angeles Arts District. In fact, there are quite a few restaurants we like in this cool part of LA that also has a number of new trendy shops and art galleries, it is actually one of the fastest growing areas of downtown now. One of the shops that has opened recently in this area, and I have been wanting to check out, is called Dover Street Market. It is a multi-brand retailer originally located in Dover Street in Mayfair, London. Throughout the years as they have grown, they have opened other locations in New York, Tokyo, Singapore, Beijing and now here Los Angeles. Dover Street Market was created by Rei Kawakubo who is the genius Japanese designer behind the label Comme des Garcons, and her husband Adian Joffe. In this store they mostly sell their own brand plus other high fashion brands and cool street wear brands. The concept behind this store is to offer a new kind of shop that celebrates creativity and pushes the boundaries of traditional retail shops. With its fresh and hip vibe, it was definitely worth checking out and as a designer I always like the inspiration I get from visiting these kinds of stores. We also love doing photo shoots in this area of LA, since there are many cool buildings and walls to use as the background. So we decided to do our photo shoot for this style feature while we were there before going to dinner. For today’s outfit, I decided to restyle our beautiful Verona Jacket for a second time. The Verona jacket has been one of our best-selling boucle jackets and whoever has received it has been very pleased with it. In fact we have a few wonderful “customer reviews” that you can read here. It is made out of a rich Italian made boucle fabric and is fully lined in a fun stripe lining. The body is semi-shaped with gold buttons and a self-fringe detail. For this look, I decided to style it with a new arrival to our online shop. It is our new pretty Lilac V Neck Blouse with Shoulder Pleats and it is made out of a really nice soft and silky fabric. The body is easy and loose, and it has a wonderful pleat detail on the shoulders. I also added a necklace which I think is really pretty and works well with this jacket. 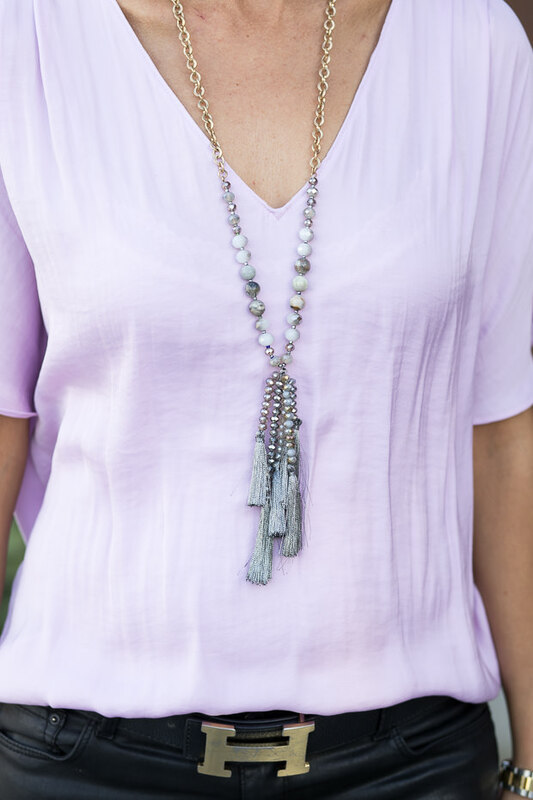 It is our new Gold Tone Chain Necklace with Gray Beads and Tassels that looks great with this outfit but of course it will work with so many other outfits as well. I also included our Black Ivory Plaid Wrap Shawl which I think looks great over the jacket or the blouse. This wrap is currently on SALE and we only have a few pieces left which you can grab at a great price today with our flash sale. I wore all these pieces with my waxed black jeans, black pumps and vintage Chanel bag. I just LOVE this jacket and that lavender tee really pops out the beautiful accent colors in it. Have a wonderful weekend! You look stunning in all of these pieces. Lavender is such a fresh color. The area you’ve described sounds like so much fun to explore.